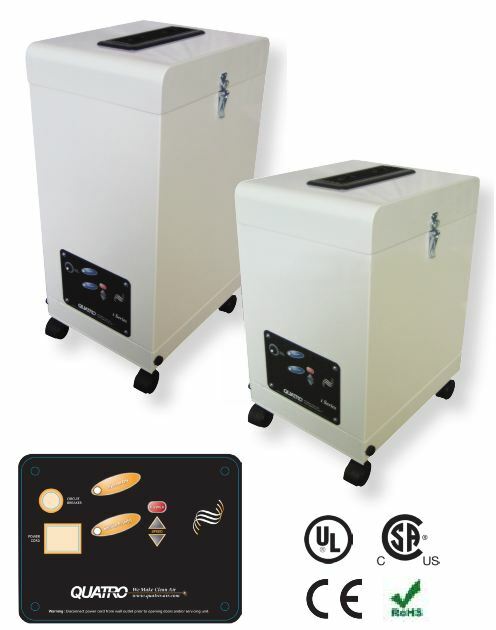 Invest in any of our BreathEasy PRO series air filtration systems, air purifiers to help reduce your exposure to dust and chemical fumes and odors. Depending on the size of the room, we have a standalone recirculating system to fit your needs. Our air filtration systems are prudently priced, so are the replacement filter and parts to keep them running effectively and efficiently. Our BreathEasy PRO series can provide air recirculation for both dust control (HEPA filters capture 99.97 % of particles as small as 0.3 micron) as well as VOC and odor control. As most large format printers are aware, off-gassing from the print material doesn’t stop the instant that the material has printed. The BP PRO series air purifiers have been shipped to thousands of print houses around the world. contaminants, the BP2000 delivers superior air quality for residential and commercial spaces, office buildings and any workshops or production facilities that require effective air filtration. 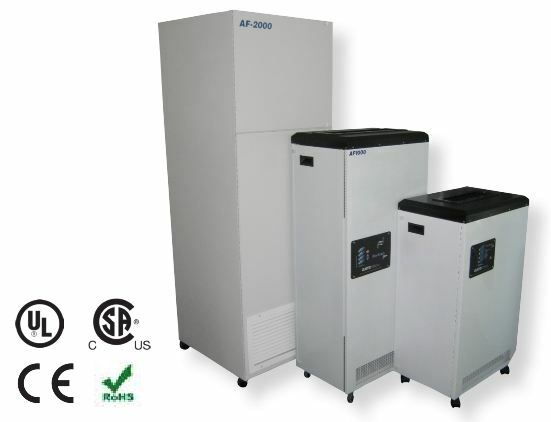 The standard configuration for BP2000 is a standalone recirc air filtration unit. For virtually any application that requires removal of chemicals, vapors and particles directly at the source, BP2000’s wide selection of flexible or articulated arms, hoods and ducting accessories capture any contaminants before they spread into the environment. The BP2000 comes in various filter configurations. The all around filter configuration for a copy machine area is the BP2001 (recommended for spaces up to 1200 sq ft x 9 – 10′ high ceiling) – comes with particulate filtration (2″ pleated pre-filter, 12″ HEPA filter) as well as Chemical gas, odor, filtration (12″ Activated Carbon filter). Call us for help in choosing the right air filtration system for your needs / application. Call toll free: 1-800-626-0664 (calling within the most of the USA and rest of Canada) or +1-514-421-0658 outside of USA and Canada. You may also fill in the Contact Form below. Printing Graphics Print Shop Room Dust Odor Air Filtration. Many of us telecommute these days, working from home, setting up a home office in the basement or a spare room. Ability to customize filters for people suffering from a specific and/or unique Chemical sensitivitybasement, a spare room. Needless to say the room is more likely furnished with your office tools and instruments – computer, ink jet printer or laser printer, a fax machine (some still use them), small photocopy machine, paper shredder, espresso machine (and why not? ), and oh, to keep us company, a big flat screen TV fixed on a business channel or CNN, etc. Dust, airborne particles, odors – you name it – can make working in there a little uncomfortable. So think about us, won’t you? We have a line of home and office air filtration system, air cleaner, air purifier – call them what you will. They’re designed to make your work environment more comfortable and safer for your health – breathing in clean air can be refreshing and invigorating, don’t you think? Remember,,,,,fresh mountain air? ?